I saw the 'Norway' in summer 1998, with my friend Carles Casadella. Both of us are older cruise ship fans, and dreamed for years to visit the old 'France'. As my readers know, I am partial to older ships, and find it interesting to study how former ocean liners were modified over the years to accommodate the growing cruise industry. The 'Norway' is the main example. She is a ship with two very different fates: she was the last of two classy true transatlantic liners, a symbol of national pride built in a time when jet airplanes were already the winners of the Atlantic race; but also was the first true mega cruise ship, ten years in advance over the present ones. Much has been written about the history of the 'Norway'. As the 'France', she sailed on her maiden voyage in February 1962. She was one of the last liners specifically designed for transatlantic crossings, with the 'Raffaello' and 'Michelangelo' of Italia SpA di Nav. in 1965. The 'Queen Elizabeth 2' of 1969 was already built with cruising in mind. During her 12-year career as the 'France', she made nearly 400 crossings between Le Havre and New York, and also 93 cruises, two of them round the world voyages. But the oil crisis of 1974 made her operation very expensive, and the French government cut its operating subsidy that year and sent her to be laid up in Le Havre for the next five years. In 1979, she was purchased by Norwegian Caribbean Line for $18 million, to complement its fleet of small "white ships" in the Caribbean. Later, she was sent to Hapag-Lloyd, the famous ship repair yard in Bremerhaven. Here, a 32-week, $45 million refit converted the former Atlantic liner 'France' to the Caribbean cruise ship 'Norway'. This operation did not result in much of a change in her external appearance. Only her stern section behind the aft funnel was changed. A warm-weather Caribbean ship needs a lot of outer decks, and one of the main jobs was to create over 6,000 square metre of open deck, 2,700 square metre of them covered with Oregon pine. Two new swimming pools were added, one in the expanded stern section, and another between the funnels. The inside pool was also rebuilt. Inside the ship were built new revenue producing areas, such as a new 800 seat main lounge, a casino, shops, and additional cabins. Her splendid forecastle has been affected by the installation of two special, 24.33 meter long custom-built tenders, each capable of disembarking up to 450 passengers at a time in ports where the 10.67 meter draught of the Norway prevents docking. On the engineering side, NCL removed two of her four turbines to provide greater fuel efficiency, and five new thrusters were installed to ease docking. When she was redelivered as 'Norway', at over 70,000 GRT, she was then the largest and longest cruise ship in the world. The Norway made her maiden voyage in May 1980 and was an immediate commercial success. But other major renovations were to follow. In the early 80's, her steam powered turbo generators were replaced with diesel powered auxiliary engines, following some power breakdowns. But in the late eighties, both RCCL and Carnival begun to build and operate the first Panamax class cruise ships, such as the 'Sovereign of the Seas' or the Fantasy' series. As a consequence, the 'Norway' lost her title of world largest cruise ship. The NCL designed another conversion in order to regain this award and, in 1990, sent the 'Norway' again to Lloyd Werft for a one month, $40 million refit, in which her profile was changed with the addition of two decks with 135 new prefabricated luxury cabins, 54 of then with balconies. In addition to the increased berth capacity (she became approximately 75.000 gross tons), a 560 square meter Roman Spa was built into a lower deck with hydrotherapy baths, replacing the indoor swimming pool and adjoining gymnasium. Also, a glass-enclosed gymnasium, with a 360-degree jogging track, were built on an upper deck, as well as a new shop and an 'A la Carte' supper club. In the latter years, more modifications were made on her interior, such as the addition of even more shops in 1996 and an Internet café in December 1999. The 'France' sailed as a two-class passenger ship. But the spaces of both classes were divided horizontally rather than vertically: each class had its own deck of public rooms. I particularly enjoyed the sheltered promenade deck. 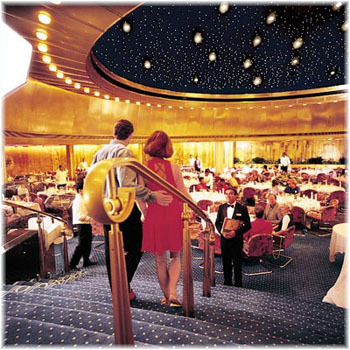 On the tourist class promenade deck, 34 suites were built in the 1980 refit, but the first class indoor promenade survives on the 'Norways' International Deck, now called Fifth Avenue (port) and Champs Elysées (starboard), and both work as the true heart of the ship. Carles and I walked on its highly polished stone floor, with great sea views, and felt like the old transatlantic passengers of the thirties, the golden years of the transatlantic crossings. Besides both promenades, my favourite room on the 'Norway' is the Club Internationale. I felt something special when I entered this room. The former First Class smoking room remains a striking, two deck high lounge complete with a bar aft, small dance floor, comfortable reclining furniture, and semicircular stairways. The decor is stunning, with windows looking into the promenade and also to the boat deck above, cozy sofas and intimate tables for two, an excellent site to enjoy a quiet conversation. During the daytime, it presented the perfect setting to read, or to enjoy afternoon tea. Club Internationale was at its best at night, as the dim light provided by the original French ceiling fixtures set the ambience for an elegant evening. Also, I enjoyed the two formal dining rooms, the Windward and the Leeward. The circular shaped Windward Dining Room is largely untouched from its days as the First Class dining room on the 'France', as well as the adjoining lobby and library. The dining room's main doors open to a grand staircase from which the passengers made a proper entrance. The main problem of this windowless room is her dome that made the Windward very noisy. Also, this room looks crowded, due a very high table density and low ceiling, except under the dome. But the ambience provided by the overhead stars and planets motif lighting and the original bronze and gold wall murals are splendid, a true work of art. From the passenger accommodation view, the 'Norway' has cabins of three different ages: transatlantic, first time of modern cruising, and "balconies revolution" ones. The former 'France' cabins are now outdated, with portholes, obstructed views, old baths, etc. As a true liner, there is some small inside cabins, but also larger ones. 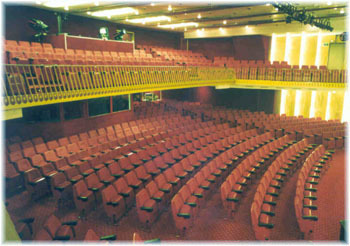 The most recent additions are the suites on the upper decks, added in 1990, Most of them with balconies. 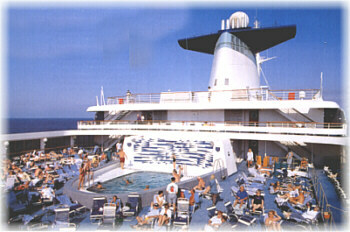 The 'Norway' set the standard for the megaships that cruise the Caribbean today: 1.000 cabins, 2.000 passengers, etc. But, while her newest rivals eclipse her in gross tonnage, the 'Norway' remains the longest passenger liner ever built, at 315.66 meters. Also she is one of the most successful cruise ships to have started out as an ocean liner. The 'France' was in service just 12 years; the 'Norway' is now 22 years old in the Caribbean. But the 'Norway' soon embarks on the next phase of her life. NCL will soon own several modern Panamax cruise ships, and the 'Norway' becomes more and more uncompetitive. After the intention to send her to Asian waters, aborted by the September 11 2001 terrorist's attacks, the NCL management will not maintain an old steamship in the very competitive Caribbean market. She is the only steam powered cruise ship that trades from a Florida port, and burns an average of 200 tons of fuel per day. I think a ship with this character deserves a dignified end, as the 'Canberra', in a breakers yard, and never trades as a floating casino. A ship whose bow has the name of two great maritime countries, such as Norway or France, deserves a great deal of respect. For Spring break of this year I chose the March 24th sailing of the Norway. My family has always been fond of older vessels and we think sea days are the best part of the cruise so we were very much looking forward to this cruise. The Norway is in excellent shape with the only noticeable physical plant deficiency being it's antiquated elevators. She remains striking in port and is still a beauty. She is remarkably stable and holds the water very well. The Spa continues to shine and received great reviews for service, products and pricing. Enrichment programs are excellent. The food quality in Le Bistro is excellent, however, the service is lack luster. Our Owner's Suite cabin assured us plenty of room as well as a private balcony and we did indeed enjoy our cabin. NCL excels at extending small courtesies to it's suite guests such as priority embarkation, treats at tea time, a video and CD library with VCR and CD player in cabin, choice of 3 premium liquors, priority tendering and debarking and an attentive concierge. NCL does a very good job with the Children's Program. The kids seemed happy and entertained. My only concern with children was that the water out of the hot water taps was so hot as to be scalding, parents should be vigilant with younger children in the bathrooms. The Norway with her exceptional draft must tender at ports that the other ships dock at. This causes what limited port time there is to be shortened considerably. If you want to maximize your port time and do not have a suite you should purchase an early shore excursion since these are the first passengers off the vessel. Cost cutting was readily apparent. It was particularly apparent in that the ship was understaffed resulting in lax service remarkably unusual for a cruise ship. The food quality and selection has also been hit hard. 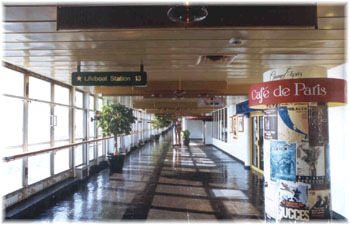 The old style deck plan is difficult to navigate and getting to the public areas necessitates traveling down narrow hallways flanked by passenger cabins. Choosing a cabin on this ship is already difficult with their disparity in cabin sizes and amenities even within each category, adding foot traffic to the equation only makes this a more time consuming task. Dining in the main dining room was average, Maitre De supervision was inadequate. 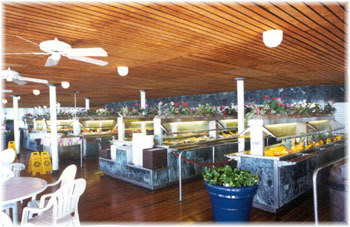 To note that lunch in the main dining room is not offered when the ship is in port but only when at sea. The Great Outdoor Restaurant is a poor choice for any meal in that it is crowded, noisy, has a poor ambiance and food that is inferior to the main dining room. Room service was slow and when we tried in-room dining the meal was delivered cold. The Norway should be reserved for clients who like older, historic vessels. They should be able to climb stairs and like sea days. This is probably not a good choice for first time cruisers as the Norway is no longer indicative of the current cruise market. If NCL chooses to keep the Norway in service I would suggest that they remove her from their main Caribbean brochure and sell her as a product by herself. She should have her own reservation team to assist with the intricate booking process.